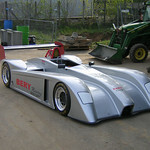 The Béry ES 7 sports racer complies with FIA safety regulations, and is now ready for importation into the USA. The ES 7 is the second version of the Béry produced by TRA Engineering of Switzerland. The chassis and suspension have under gone significant changes since the previous 2005 model. Additional improvements include a cockpit that is 20% larger to accommodate full size drivers. Chassis construction continues to be aluminum monocoque with integral steel roll structure. The engine in the initial ES 7 is a fuel injected Suzuki GSXR 1000, that has been dry-sumped. The car uses conventional shocks and springs, actuated by rocker arms. However, the arrangement at the front appears to utilize a interesting mono-shock/spring. Additional photos and larger images can be viewed in the Béry ES 7 Photo Gallery.